Home » Coast to coast » Will labor purchase of Sun-Times make it working-class? Will labor purchase of Sun-Times make it working-class? Chicago, Aug. 31 — In July, an investment group led by the Chicago Federation of Labor and businessperson Edwin Eisendrath announced that the group had acquired the Chicago Sun-Times. The Sun-Times is one of the two remaining daily newspapers in the country’s third-largest media market. The CFL is made up of more than 300 affiliated unions in the city and Cook County, representing roughly 500,000 members. Does the CFL’s new ownership role mean that the Sun-Times will now become the independent media voice that the working class so badly needs? History suggests that the answer is no. 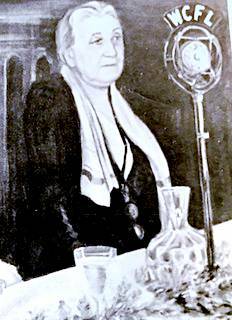 Painting depicting Jane Addams delivering Women’s International League for Peace and Freedom address over WCFL in May 1935. This is not the first time that the CFL has ventured into media ownership. The CFL founded radio station WCFL in 1926. Calling itself the “Voice of Labor,” WCFL was the only labor-owned station in the country for most of its half-century on the air. It began as a noncommercial, listener-supported station, providing airtime to unions and progressive groups throughout the Midwest and featuring labor and public affairs programming. Programs in 1926, for example, focused on the struggles of locked-out British miners; a textile strike in Passaic, N.J.; and prospects for organizing white-collar employees. WCFL also put a pro-labor spin on its other programming, including quiz and variety shows and popular entertainment. But by trying to operate as a workers’ island in a capitalist ocean, WCFL was beset by difficulties. Federal policy favoring large commercial stations over small, public-interest stations resulted in restrictions on WCFL’s hours and power. Big broadcasters adopted “ethics” codes that barred airing of such “controversial” issues as labor struggles. WCFL also met with resistance from the conservative American Federation of Labor. To the AFL, WCFL’s attempt to voice labor’s independent interests threatened the AFL’s “business union” elevation of union-management cooperation over class struggle. Rather than give the working class its own voice, the AFL preferred to purchase placid spots on established commercial outlets that would curry the bosses’ favor by portraying unions as respectable and patriotic. Moreover, running a radio station was costly. Unions themselves could not make up the shortfalls, especially given the challenges of the Great Depression, and bank loans came with intrusive conditions. By the end of the 1930s, financial and external pressures had morphed WCFL into a more typical commercial station dependent on advertising. Discussion of labor struggles was anathema to commercial advertisers, which forced WCFL to drop much of its initial focus and revert to standard entertainment programming. It continued to provide some time for labor announcements and labor analyses of contemporary events, but even these had to give way to the demands of profit, and the station ultimately became a Top-40 rock music vehicle in the 1960s and 1970s. After this writer moved to Chicago in 1970, he often listened to WCFL with no idea of the significance of its call letters or that it was anything other than the voice of rock-and-roll. The Mutual Broadcasting System bought WCFL in 1978. MBS was a radio-network affiliate of Amway (which was founded in part by the ultraconservative DeVos family) that sought to promote right-wing and anti-union ideology over the air waves. The call letters WCFL did not fit that agenda and were later dropped. With this history in mind, we cannot expect a Sun-Times partly owned by the CFL to serve as a tribune for an independent working-class perspective. Placement of a labor official instead of a rapacious tycoon as chairperson cannot undo the capitalist relations that govern big media in this society. Small media outlets, however progressive, must confront the daily economic and political constraints of capitalist society. The Sun-Times remains a privately owned enterprise run for profit. As with other businesses, chasing profits means squeezing more work hours from employees for lower pay and fewer benefits, a management agenda not conducive to a pro-labor editorial slant. And any profits must rest on sales of big blocks of commercial ads to anti-union companies like Walmart and Target, which will not allow the Sun-Times to advance a pro-labor agenda. Moreover, the Sun-Times begins this new page in its history deep in debt. Although the CFL and its partners purchased the paper for only a symbolic dollar, they also assumed the paper’s substantial debts, borrowed an additional $11 million to cover anticipated initial losses and pledged to invest borrowed millions in operations. The need to service this debt will reinforce reliance on advertising, giving advertisers leverage over broadcast content and undermining any attempt to align news coverage and editorial policy with working-class interests. Regardless of who owns it, the Chicago Sun-Times operates in an industry wrenched by economic, technological and social change. Nominal labor ownership cannot override harsh economic realities stemming from technological advances that make news instantaneously and freely available on multiple platforms. According to the Bureau of Labor Statistics, in the past 15 years, more than half of news industry jobs have disappeared. A Pew Research Center report shows that newspaper circulation has seen 28 straight years of declines. The appointment of a labor official to run the Sun-Times is related to this crisis in the news industry. In his great work, “Imperialism, the Highest Stage of Capitalism,” Lenin noted that “lucrative and soft jobs … on the editorial staffs of ‘respectable’, legally published newspapers” are “bait by which the imperialist bourgeoisie attracts and rewards” collaborative labor officials. (tinyurl.com/yc6j2j5g) Looking to labor federations like the CFL to rescue capitalist enterprises in crisis is a prime use of such bait. Unsurprisingly, the content of the Sun-Times has not noticeably improved since the CFL-led purchase. At most, it leans a bit more towards the Democratic Party in its debates with the Republican Party. But the workers are not represented in those debates, which are primarily over how to most effectively run the U.S. empire and exploit the workers and oppressed. The workers and oppressed need their own media voice, one not muffled by commercial pressures. Only such a voice can express their needs, defend their interests, broaden their horizons and pave the way for a socialist world. Labor Beat covers labor struggles on its TV shows and videos, including “Fight for $15” and the ongoing strike by Chicago-area auto mechanics against retail auto dealers. It also has reported frequently on labor involvement in anti-war and immigrant-rights movements. But its availability and budget are quite limited, as is its impact. 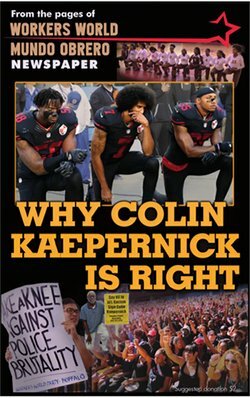 Revolutionary socialist newspapers like Workers World offer a more comprehensive working-class alternative to the corporate media version of the world. Their circulation and impact are currently small but will increase as the socialist movement grows. Indeed, a strong socialist newspaper can itself spur the growth of such a movement. At bottom, the struggle for the emancipation of the workers and oppressed requires their own independent media. Collaborating with capitalists on a bourgeois paper like the Sun-Times leads nowhere but to a dead end.